Good morning! 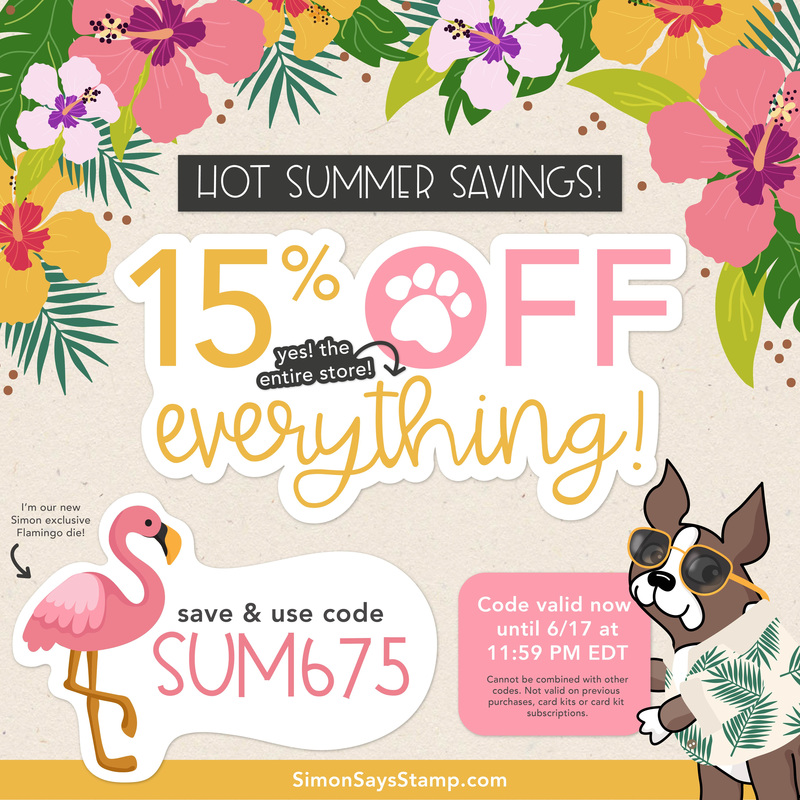 I’m super excited to be a stop on the hop for the Simon Says Stamp DieCember blog hop!! I’ve already shared two cards using the new release here and today I’m sharing two more cards! My first card uses the stunning Holiday Knit background die. I simply die-cut it from white cardstock and adhered it to a white card base. Then I adhere silver, aqua, and blue jewels over the holes in the pattern to create a jeweled, sparkly design! I wanted to keep the rest of the card simple so I just die-cut the Merry word die from silver glitter cardstock and the outline once from white cardstock and once from soft navy cardstock. I adhered the white and soft navy cardstocks at a slight overlap and then adhered the silver glitter sentiment on top. I adhered it with foam mounting tape so it wouldn’t run into the jewels! 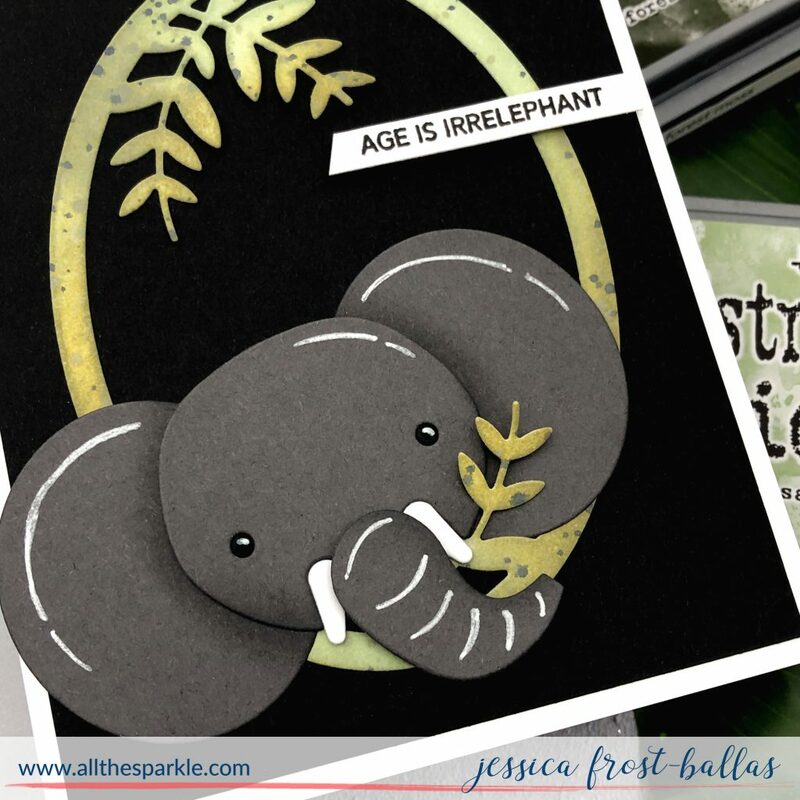 My second card uses one of the new big picture book dies: the elephant along with the mod leaf oval die! I started by die-cutting the elephant with slate grey cardstock. Then I added a little bit of blending around the edges with black soot distress oxide ink. I die-cut the eyes with black cardstock and the tusks with white cardstock and adhered the elephant together by placing a piece of washi tape behind the openings for his eyes and tusks. Then I used foam mounting tape to adhere the ears for a little dimension. 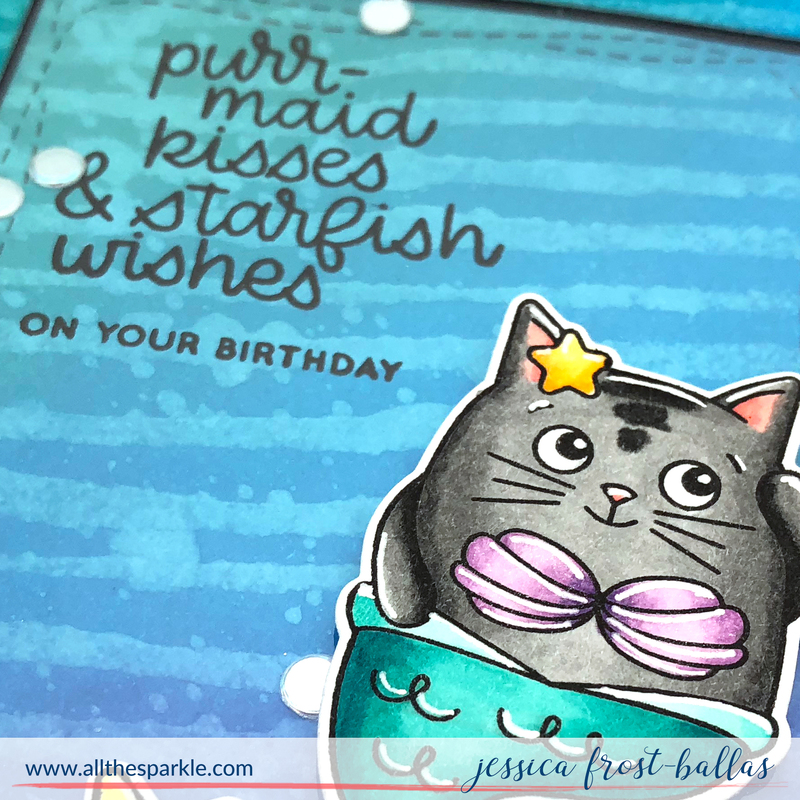 I stamped the sentiment from Punny Animals onto white cardstock with versafine and heat-embossed it with clear embossing powder. I die-cut the sentiment with the Sentiment Label dies and trimmed the edge to an angle. Next I die-cut the Mod Leaf Oval die with white cardstock. I blended bundled sage and forest moss distress oxide ink over the die and spritzed it with water. I also splattered it with forest moss ink. Once it was dry I adhered it to a black card panel. I tucked my elephant in amongst the leaves and then added the sentiment with foam mounting tape. Then I trimmed down the black panel and adhered it to a white card base! Finally I added a few accents with spectrum noir clear sparkle and a white gel pen. Check out the DieCember gallery on the Simon Says Stamp blog for even more crafty inspiration! And we have a special gift for all of our blog hoppers this weekend!! 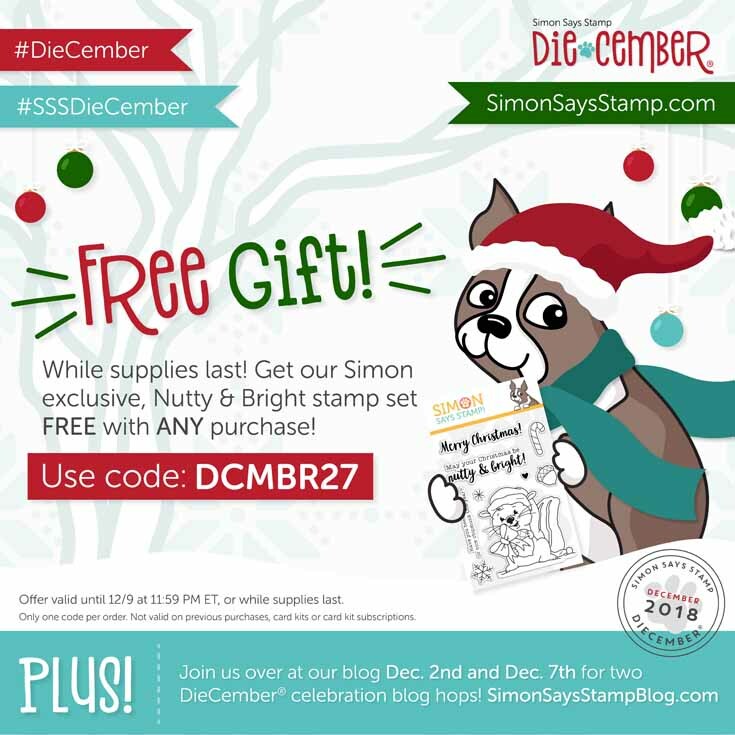 Use the code DCMBR27 on any purchase at Simon Says Stamp this weekend for your Nutty & Bright gift! The jewels really make this card pop. Love it. Jessica, your elephant card is so adorable! Thank you! I especially love the Holiday Knit background. The jewels look beautiful on your card, too. The punny sentiment on the elephant is cute. 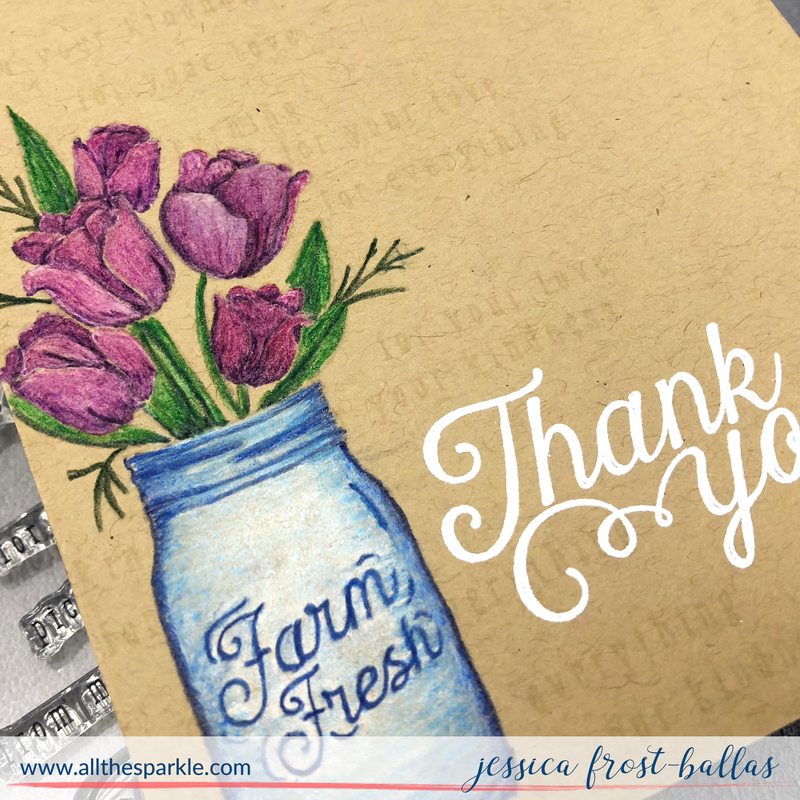 Both your cards are fabulous Jessica, love the elephant and that great sentiment!! Wow! You made the Holiday Knit die even more spectacular with the addition of those jewels. Love your elephant card. What a sweet elephant card! Wonderful cards! Love this kit! Love the arrangement of the gems on the first card and the phrase “Age is Irrelephant” is my favorite. So clever. I always love how you put things together. Thanks. Your cards are Great! I’m especially fond of the elephant with that sentiment, too cute. Thanks for sharing and inspiring. 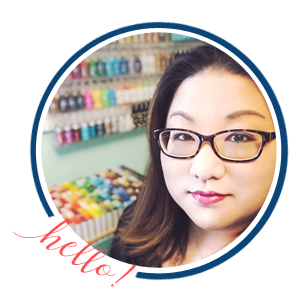 Love your bejeweled card! So pretty! Your Holiday Knits card s gorgeous; your elephant, absolutely adorable! Irrelephant..oh my stars! Giggles galore! Such unique card designs, Jessica! 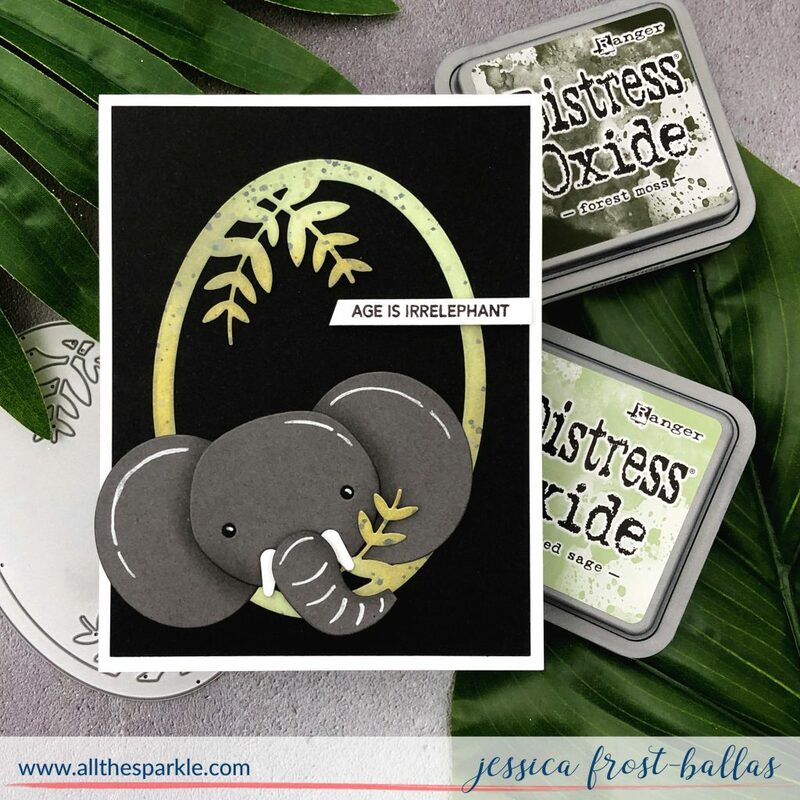 Love the jewels on the first one and the elephant die cut is just so, so cute! That elephant card is seriously one of the best things I’ve seen. Ever! Great job! The elephant is my favorite! What a great card and sentiment!!! Your first card is very elegant looking!! Your elephant card is adorable!! I love the dramatic elephant card. The distress on the elephant really takes it to another level. Both cards are stunning. I especially like the white one. The background die is just so beautiful. You are an inspiration. That Merry background is awesome. Love both of the cards!